I did not own an umbrella until I lived in California. I was thinking about this, last week, as I walked to my car, in what the locals call "freezing rain", and I was wearing the wrong jacket, sans umbrella. It is funny that I did not own an umbrella because where I grew up, Southeast Alaska, is considered a temperate rain forest. My hometown receives a yearly average of 49 inches of rain. But, when I lived there, I did not carry an umbrella and neither did most people I knew. I suspect there were a couple of drivers for this: first, when it rains with such frequency, you dress for it. I think most of what I owned, outwear wise, was water resistant. (The one exception being a pair of 80's "moon boots" for the snow that really served as sponges to absorb slush and water. Anyone else have a pair of those worthless things?) Second, umbrella's are kind of a pain to deal with: opening and closing while getting in and out of a car, and drying them out, bleh. In SoCal, the rain was so rare, it was a fun diversion to pull out my umbrella and rain boots, (both striped, natch.) A rainy day felt like it's own type of holiday, where we could justifiably eat hot soup and grilled cheese and stay in and watch movies. Now, living in Washington, once again rain is a regular part of my life and so I need to find my umbrella. I am learning about all sorts of new weather too- inversion fog, the aforementioned freezing rain, and a regular wind that blows so strong, neighborhood trees grow at a tilt. Soup, rather than being a holiday treat, is de rigueur. As a I shared in my post on split pea soup, I have been stocking my freezer up, which pleases my inner Marilla Cuthburt. 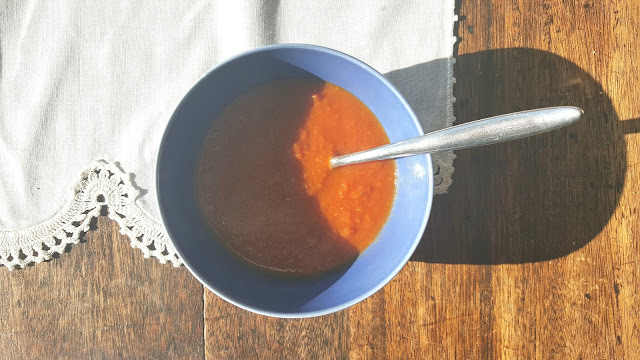 These past months I returned to an old favorite- roasted tomato carrot soup. I first made this about 16 years ago. That December, for my 21st birthday, my friends threw me a beautiful dinner party at their apartment. The starter was Ina Garten's roasted tomato basil soup. The finish of the meal was when the party guests took turns saying kind things to me, which included one friend confessing, to a table of people and my new husband, that he secretly had a crush on me for two years. The evening was a memorable one for many reasons. While I do not recall how I replied to my friends confession, I do remember I loved the soup. At the time, my husband and I rented a small one bedroom second story apartment that faced a courtyard with a pool. An architectural throw-back to the 1950s, I don't believe the stuccoed walls held a stitch of insulation. 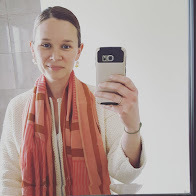 When temperatures would get "chilly", in the 50 degree range, (hilarious, now that my daily high is in the 30s), I liked to cook in the oven, as the apartment was small enough that a good casserole could really warm things up. I wanted to re-make Ina's soup, but round out the acidity of the tomatoes. Also, while the roasted tomato and basil is delicious, sometimes it reads too much like pasta sauce to my palette. 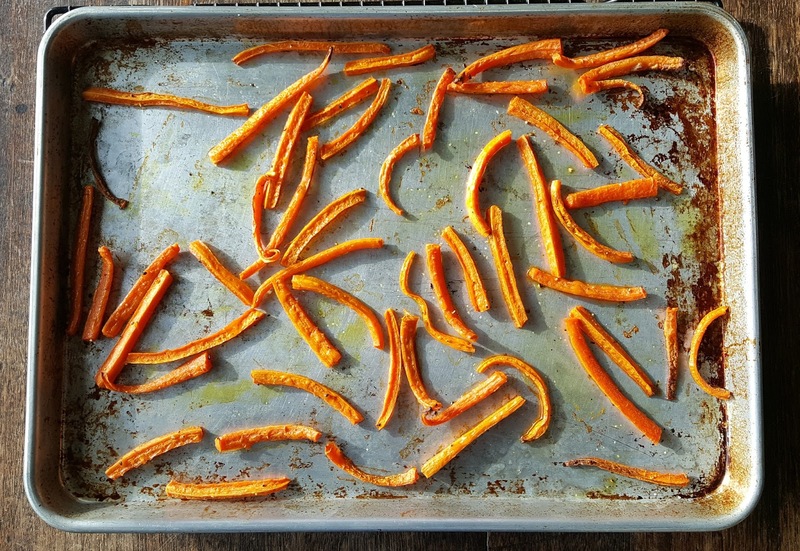 The solution became adding a pan of carrots to the oven, along with the tomatoes. This addition also results in soup that is a gorgeous orangey-red, like a color from a J.Crew catalog. Over the years, I have made many iterations of this soup, tinkering to get my desired flavor and texture. I think it is perfect all on it's own, and for those of us making more healthful choices after two months of drinking eggnog in our morning coffee (ahem), it is a good fit. But, it is also sublime when finished with a splash of heavy cream or dollop of sour cream. 1) Preheat oven to 400. 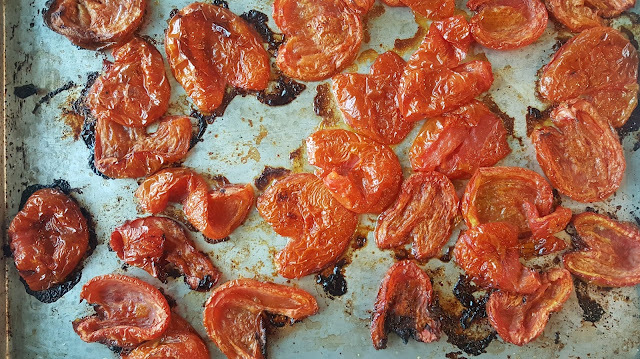 On a large rimmed baking sheet, toss the halved tomatoes with olive oil and salt. Roast for 90 minutes or until the tomatoes lose their shape and start to char. On a second rimmed baking sheet, toss the carrots with olive oil and salt and add to the oven, alongside the tomatoes. Roast the carrots for 60 minutes or until they are tender and edges start to char. 2) Meanwhile, prepare the soup base: heat the olive oil in a large soup pot (preferably one with a heavy base). Saute the onion over medium heat until translucent. Add the garlic and cook briefly, (seriously, like 30 seconds) and then add the chicken stock. To this soup base, add the roasted carrots and simmer for about 15 minutes. (Why? The carrots have a tendency to get a bit shriveled around the edges and it do not blend up as smoothly in the final product. I like the flavor that roasting produces but recommend softening them up in the soup base for a bit). 3) Once tomatoes are roasted, add to the simmering carrots and stock and then also add the can of tomatoes and fresh thyme. Bring it all to a simmer. Remove from heat and, using an immersion blender, blitz it all until consistent smooth texture. Please take care not to splatter yourself with hot soup. If it's all a bit thick, you can thin out with a water that's been swirled in the leftover can from the tomatoes (just and idea).